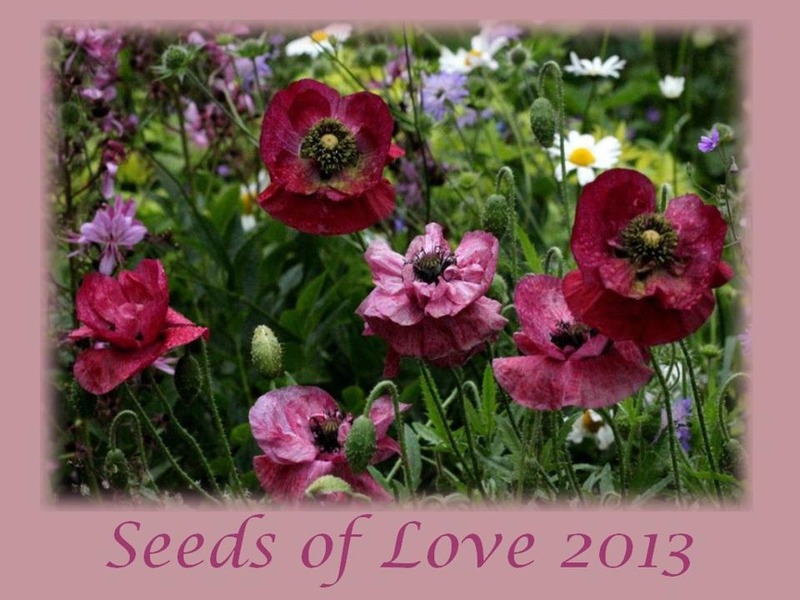 Mercurelli's Garden Design: Seeds of love 2013 - Winners and surprises! What amazing days!!! Thanks to Isabella and her great iniziative, in just 4 days I have been catapulted in a frenetic and enthusiast community of Garden-Lovers spread through all the Europe! Isabella asked everyone to offer at least 3 different kind of seeds and to extract at least 3 partecipants. 31 ---> Eddy, who brings at home Hibiscus trionum 'Simply Love' and Helianthus annuus 'Total Eclipse'. 37 ---> Zoraly, who brings at home Oryza sativa 'Black Madras', Hibiscus trionum 'Simply Love' and Libertia grandiflora as well! The number of available seeds was not enough to extract other numbers... but the Tropaeolum majus 'Tom Thumb Mixed' seeds were waiting to explore the world...so I scrolled the list until I found someone ready to welcome them in their garden: Lydie and Régine, numbers 10 & 12! It seemed all settled... BUT there have been so lovely partecipants, so fabulous people and I could not even think about leave the other with bare hands (or bare pots!!!). My profession (and passion!) has led me to have a little collection of very interesting seeds...however most of them are in very limited quantities... how send them without hurt anyone? And how to decide what to send to who? And suddently I found!!! The next 50 hours will see the birth of my New Blog and of Mercurelli's Garden Design FB page ... I cannot wait and I keep wondering what people will think about them! So...why do not combine the two!?!?!? Would be very useful to me to know your impression and thought about them...so to give another opportunity to those who have not been extracted... I will offer 6 PERSONALIZED SEEDS COMBINATION to 6 people extracted between the Blog and the FB page! E' un eccellente idea e provvederò subito a pubblicizzare la tu anuova pagina di FB con gli amici. Ho tanti tipi di semi diversi ma tutti in piccolissime quantità e proprio non sapevo come inviarli senza creare scontenti...mi è sembrata una buona idea!!! That's a great idea !!! It makes the Seeds of Love still more interesting, thank you. Thanks Isabelle! But most of all, thanks so much for your initiative! I really loved it and I met such wonderful people! Thank you! fantastico,mi piace come ti muovi.......farò pubblicità.....un abbraccio!!!!! Woot :) thank you verry much ! Mi piace questa cosa sappilo! Baci e buona serata u! Tu es venu un peu "avant les autres, dans la phase de construction. Que pensez-vous du résultat final?